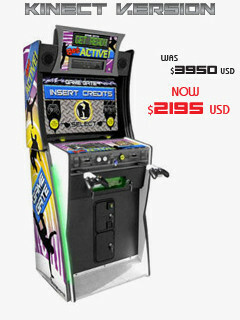 The Game Gate VU is an innovative coin-operated machine allowing you to use home market technology to play in an arcade style cabinet. 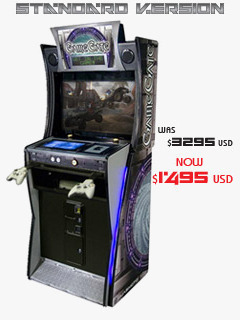 Allowing you to play 100s of Xbox 360 games through wired controllers, the Game Gate VU also includes a new Xbox Kinect feature which permits you to hook-up the popular new Microsoft game onto your machine. There are two available models: the Standard and the Kinect Ready model. The standard is now offered at a special price of $1495 USD (discounted from the original price of $3295 USD) and the Kinect Ready model is now being offered at a special price of $2195 USD (discounted from the original price of $3950 USD). Both models are perfect in a variety of locations, such as: home entertainment rooms, games rooms, kids play areas, work or staff rooms, common areas, offices, waiting rooms, etc. For more information please use the form below to register your interest.